Class 6A No. 1 ranked Tucker and No. 8 Stephenson rolled to Region 4-6A road victories to remain tied for first in the region standings. 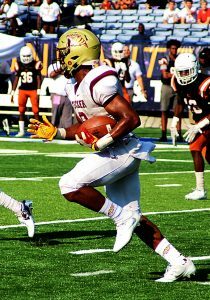 Joshua Vann celebrated his U.S. Army All-American selection by hauling in five pass receptions for 128 yards and a pair of touchdowns to lead the Tucker Tigers (7-1, 5-0) to a 62-12 victory over Charles Drew (2-6, 1-4). The Tigers jumped out to a 21-0 lead on rushing touchdowns by Gerry Vaughn (7 yards), Taurean Taylor (5 yards), and Darick Stephenson (5 yards) all in the first quarter. Vann struck with 32 seconds left in the first quarter as quarterback Travon Ford hit him streaking down the sideline for a 61-yard touchdown pass play to make it 28-6 heading into the second quarter. Taylor added touchdown runs of 36 and two yards in the first seven minutes of the second quarter to make it 42-6. Ford would hook up with Vann again as the All-State wide receiver took a screen pass 34 yards for a score and a 48-6 lead at the half. Vaughn would add a 38-yard score and Donny Harris ran in from six yards out to make it 62-6. The Tigers finished with 310 yards and seven touchdowns on the ground in the game. The Jaguars (6-2) won their sixth consecutive game and improved to 5-0 in the Region 4-6A standings alongside Tucker with a 35-2 win over Mt. Zion-Jonesboro on Thursday night. Stephenson rolled out to a 21-0 lead as well in their win over Mt. Zion and were never tested in the win. Mt. Zion would get a safety to make it 21-2, but the Jaguars responded with a pair of touchdowns to close out the game 35-2. Stone Mountain scored first, but the Class 3A No. 1 ranked Cedar Grove Saints roared back with 48 unanswered points to win the Region 5-3A contest 48-6 at Godfrey Stadium on Saturday night. The Pirates (1-7) got on the board first to go up 6-0 early in the first quarter. Cedar Grove (8-0, 5-0) answered with 28 first quarter points to go up 28-6 heading into the second quarter. The Saints would make it 42-6 at half and scored once in the third quarter for the final of 48-6. Cedar Grove has won 18 consecutive games including the Class 3A state championship dating back to September 23rd loss to Westminster last season. 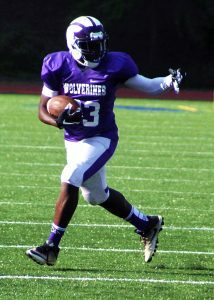 The Miller Grove Wolverines broke a two-game slide in Region 5-5A action with a come-from-behind homecoming 25-20 victory over the Columbia Eagles on Friday night at North DeKalb Stadium. Columbia led 12-6 at the half before Miller Grove (4-4, 1-2) rallied to go up 19-12 at the end of the third quarter. Columbia (4-4, 1-2) pulled within 25-20 with 2:04 to play but the Wolverines held on for the win.